Ministry beyond the four walls of the church is a high priority at the Chapel. As one of the founding congregations of RCS, we are proud to be their top supporting faith community. RCS has provided Help & Hope to People in Need for almost 50 years. RCS helps individuals and families facing hunger, homelessness, and domestic violence. RCS is committed to supporting the most vulnerable among us. Their mission is hope, restoration, and the stabilization of our community. Learn more about Religious Community Services. Each month a team from the Chapel prepares and serves a meal for homeless individuals through the Peace Café at Peace Presbyterian Church. Volunteers can cook, serve or both. Usually the third Thursday of each month. Participants head south on the beach from Palm Pavilion. 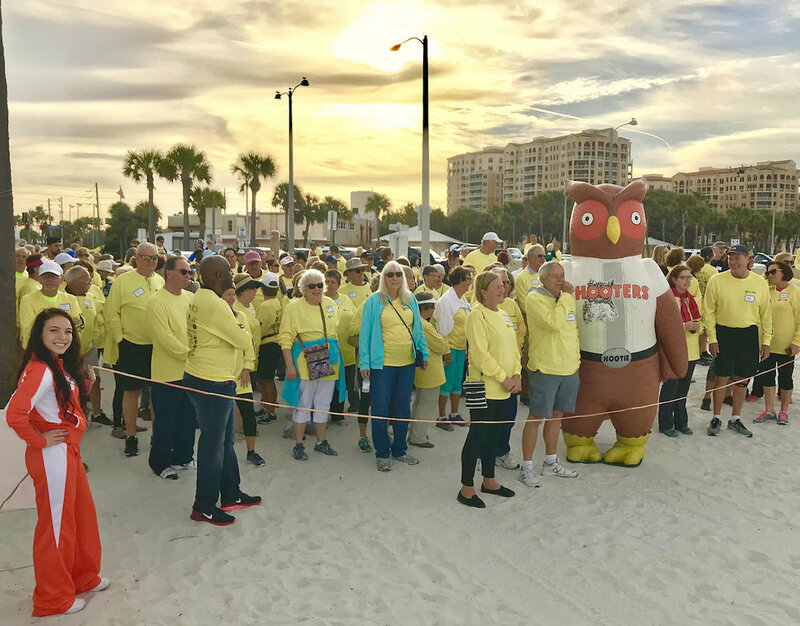 Each year we host and sponsor the Beachwalk/Walk, “A Clearwater Beach Tradition!” Participants walk from the Palm Pavilion to Pier 60 and back to the Chapel for a pancake breakfast. Participant fees and sponsor donations enable us to present a sizable gift each year to Religious Community Services for their outstanding ministry. Fun! Sun! Sand! Click here to register or become a sponsor. The next BeachWalk/Walk is scheduled for February 2, 2019. 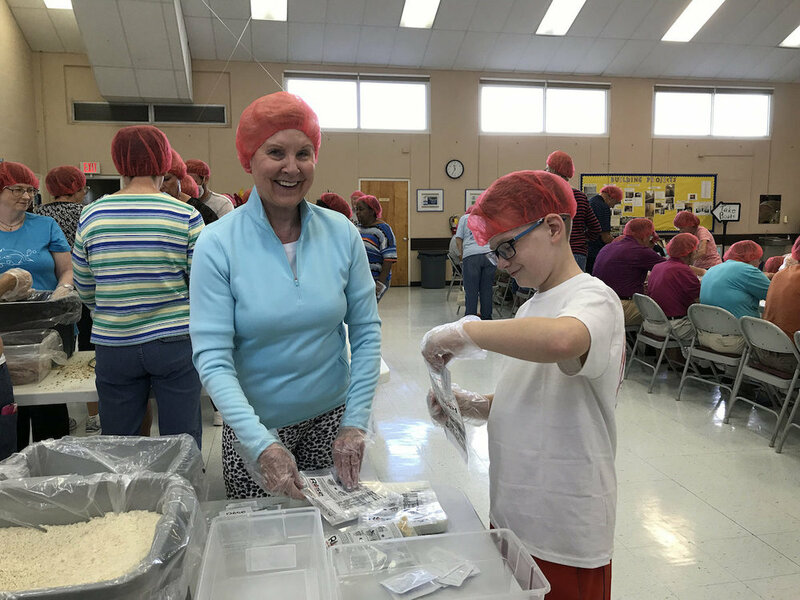 We partner with Rise Against Hunger to package 2,500 packets/15,000 dehydrated meals for families in countries facing food scarcity. Each packet contains vital vitamins and nutrients to feed a family of six for one day. Established in 1998, Stop Hunger Now is an international hunger relief organization that coordinates the distribution of food and other life saving aid around the world. Rise Against Hunger’s meal packaging program has provided over 110,000,000 nutritious meals to more than 43 countries. On packaging day, over 70 volunteers from the community gather to staff funnel stations, scale stations, sealing stations, and finally, boxing stations to ensure delivery to the designated country. This three-hour event is definitely a “hands on” project for all ages. Participants as young as four and as old as 94 have participated in the past. Learn more about Rise Against Hunger. Pinellas County Habitat for Humanity is one of the strongest chapters in the nation—last year, they built over 50 homes for qualified families. Each recipient of a Habitat home must complete a large number of “sweat equity” hours by volunteering on homes being built. Recipients also attend personal finance classes and carry a zero-percent interest mortgage on their home. The houses are sustainable, using energy-star rated appliances, so that families can continue to occupy their homes as the cost of utilities increase. Chapel by the Sea is pleased to participate both financially and through our own “sweat equity” so that we can do our part to provide affordable housing in our own community. Chapel’s Build date is January 19, 2019. We are proud partners with the International Council of Community Churches, an international, intercultural, interracial fellowship of churches and ministry centers which seeks Christian unity in local, national and world relations. As people devoted to following Christ, the ICCC is committed to community, to treasuring diversity, and to living our faith in service and love. Through our participation in the International Council of Community Churches, we support the international efforts of Church World Service, a faith-based organization committed to transforming communities around the globe through just and sustainable responses to hunger, poverty, displacement and disaster. In times of natural disaster, we support relief efforts across the globe through this organization.